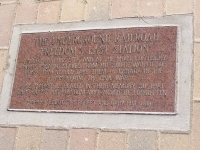 Marker reads: THE UNDERGROUND RAILROAD "FREEDOM'S LAST STATION"
The year 2011 will mark two very special anniversaries. The first will be Lakewood's own birth 100 years ago as an official "city." The second anniversary will mark the 150th year since the beginning of the American Civil War. In a very unique way, Lakewood's own history is closely related to both commemorations. Silently in the darkness, the quaintly dressed man emerged from behind the huckleberries at the edge of the vast ravine. "It is well," he whispered to the forlorn group behind him, "thee can emerge from the tunnel now. Come follow me, but do so step by step, and carefully. One little slip and thee will take us all off this cliff." From the crawl-tunnel behind him came a tired group of six fugitive slaves dressed in a mixture of dirty calico, gingham, and tattered flannel; each holding onto part of a long thick rope for safety. Only two of the group had anything that might remotely pass for shoes. Slowly, ever so slowly, they began the descent down the side of the ravine and into the Rocky River valley. At the edge of the river, running shallow in the still, humid silence of a warm August evening, the group waited patiently on the smooth river stones. Suddenly, and quite faintly, a lantern's light revealed itself on the opposite bank: twice, and then once. "Yes," whispered the quaintly dressed man, "that is indeed the signal for thee to cross, but do so quickly, but quietly now. Noise travels a great distance over water!" A young ebony-skinned boy of fourteen bit into his lip as he entered the river. Deep lacerations on the soles of his feet stung greatly in the flowing, cool waters. On his back were many older lacerations, whippings from his earlier escape attempts. On his soul were even greater lacerations that could not be seen. One by one, each crossed the river to the spot where the lantern had last been seen. As the last one arrived on dry ground, the lantern, being only a few feet from the party, opened again barely an inch. By the lantern light, the outline of a lady in a Quaker bonnet and gray dress could be discerned. "Go now to yonder Indian rock," she motioned, "thee will find food, comfort, and blankets there. Thee will rest and have meeting together. Then, thee must climb up this side of the rocks. In a short while, thee will come to other cliffs. These will be the cliffs of freedom, for they stand on the great Lake Erie. We cannot go up this valley to Lake Erie tonight, for the slave catchers are encamped there. Tomorrow night, the boat will come to take thee to Canada. Thee will soon be free!" The following evening, a small boat arrived at an even smaller inlet near today's Lakewood Park, and six grateful former slaves left the United States over the silent gentle lapping of the darkening mid-summer waters. The Quaker couple on the bank then returned to their carriage and opened wide the wire-caged lantern. With a "Go now, Friend Horsey," they started off on the long return to their home, with their midnight-black Arabian mare leading the way. Although the story above may be fictional in its particulars, in general terms, the facts of what happened right here in the Lakewood/Rocky River area speak for themselves--but only if you look closely. Internet and library searches do not have a great deal of information concerning the Underground Railroad in this area, and the principals involved at that time generally kept quiet about their participation, even after the Civil War because the heroic deeds they had performed were, after all, quite illegal in the eyes of our government. 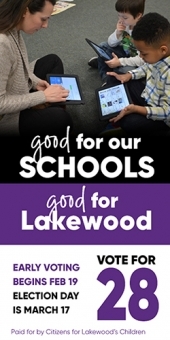 Only stories, shadows, rumors and occasional facts emerge for the potential researcher of this sad yet glorious chapter of Lakewood's history. The mouth of Rocky River was one of many places where the former slaves were taken to wait for the boats. Quite often, unfortunately, they were betrayed at the last minute into the arms of the slave catchers. Sometimes, they made their way on foot to the cliffs and inlets along the coastline to wait, as in the story above. Sometimes, according to other sources, they quietly made their way down to the lake through one or more long underground tunnels that began in the cellars of local homes. The Quakers, by the way, were a group of self-described "peculiar people" who took Jesus' "Sermon on the Mount" quite literally. They also felt that the inspiring words found at the front of the Gospel of John, "the true Light that lighteth every man that cometh into the world" (KJV), meant that the light of God was in all of humankind, and therefore all people were equal before God and brothers and sisters in the "Light." During Oliver Cromwell's time in England, the use of the personal "thee" in speech was banned for the more impersonal, formerly plural "you." Quakers refused to abandon the word "thee" because to do so would involve treating people as class-conscious groups, instead of as individual God-filled Children of the Light. Even today, many Quakers continue to use this "plain speech." Quakers refused to fight in wars, swear oaths, or remove their hats in the presence of "superiors." They wore simple clothing and wanted only to bear witness to what they felt was God's work on earth. Hundreds of them died or were imprisoned for their witness. Many, though not all, Quakers opposed slavery. The Underground Railroad was the name given to the means by which fugitive slaves were brought out of the South and transported to Canada. Though usually neither underground nor a railroad, hundreds of people called Abolitionists helped these former slaves on their way to freedom. Many people of other faiths were also involved with the Railroad. Places like the Pomeroy House in Strongsville and the Hubbard Home in Ashtabula (called "Mother Hubbard's Cupboard") were also reportedly stations on this secret pathway to Canada. 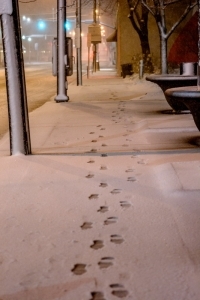 Nearby Oberlin was also said to have been a major center of Underground Railroad activities. Slavery had never been permitted in Ohio, or for that matter in any of the Northwest Territories. For years, if fugitive slaves made it into Ohio in the 1840's, they were free. In 1857, however, a former slave named Dred Scott had returned from his free home in Indiana to a slave state and had been again made a slave. He petitioned the Supreme Court for his freedom. The Supreme Court, under Chief Justice Roger Taney, shook the entire country by stating that no black, whether slave or free, could ever be a citizen. Furthermore, all states had to recognize slaves as property and enforce their return to their masters, in a reinforcement of an 1850 Fugitive Slave Law. Having never allowed slavery, many Ohioans were furious, and disregarded the decision of the Federal Court. The Underground Railroad then kicked into high gear, as it became clear that Canada was the only option for true freedom for the slaves. Border cities like Detroit were too densely populated to permit many secret slave crossings. That left the crossing of Lake Erie, and brought the area that we know today as Lakewood, into a central role in the Underground Railroad. As we now have that beautiful walkway down to the water's edge at Lakewood Park, perhaps it would be well to reflect back to that fictional August night, and perhaps to a great many other such nights on the cliffs around Lakewood, and in the Rocky River lagoon. As you, er, THEE, walk down this historic walkway, think about those rocks as being the last stepping stones to freedom for a people torn from their homes in the heart of Africa, brought to this land in chains, and having to leave it in order to achieve the freedom so many other Americans take for granted. A great many died as well, perhaps on those very rocks around the walkway. In 2006, Dad and I, with the blessing and help of our city, placed a monument at the top of that walkway so that generations from now, people will remember what happened here. In the past, this chapter of American History has often been hidden from view as an embarrassing affront to our country's image as a beacon of freedom for all, but here in Lakewood, the North Star, that beacon of hope at the end of the Big Dipper Drinking Gourd in the sky... the star that guided those escaped slaves to a new life of freedom...never shone brighter than here in this place. A special thanks to Vic Silverman, my Lakewood High School Social Studies teacher, for taking us to the Pomeroy House so many years ago, and for igniting within us the spirit of remembrance.